Gaza terror group says it turned down Qatari money after Israel barred funding of Hamas terrorists. Hamas vows ‘retaliation’ against Israel. 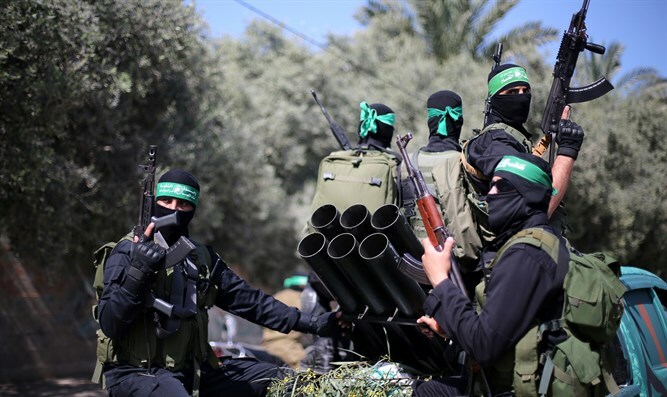 The Hamas terror organization threatened Israel on Friday, vowing to confront the Jewish state and “immediately retaliate” as a standoff over foreign funds to the Gaza Strip continues. Senior Hamas officials told the Al-Akhbar Lebanese news outlet Friday that it had a “threatening message” for Israel, warning that it would “immediately retaliate” to an Israeli “aggression”, warning that its response would be “even greater than” the last major confrontation – referring to attacks in November of last year. Hamas also demanded that Israel drop the conditions it placed on the transfer of Qatari funds to Gaza, including Israel’s ban on payments to Hamas terrorists. Khalil al-Hayya, a senior Hamas leader, told Al-Akhbar the terror group had rejected the Qatari money transfer Thursday because of limitations placed on the payment by Israel. The Gaza-based terror group has demanded that the amount permitted to be transferred from Qatar be increased from $15 million to $22 million, and that payments be allowed to known Hamas terrorists. Israel has conditioned the Qatari money transfers on the pledge that no funds be transferred to Hamas terrorists. In November, terrorists operating out of the Gaza Strip fired hundreds of rockets at Israel, prompting the IDF to respond with a targeted air campaign against Hamas positions in the Strip. The two-day escalation left two dead and nearly 60 injured on the Israeli side, and marked the worst violence between Israel and Gaza since August 2014. Hamas has accused Israel of ‘escalating’ the conflict this week, when a special prison guard unit made a surprise inspection of terrorists’ cells at an Israeli prison west of Jerusalem. After prison guards found weapons, cell phones, and other forbidden items in the prisoners’ cells, dozens of terrorists held at Ofer prison rioted, lighting fires in the facility and injuring two guards. On Tuesday, Hamas terrorists opened fire on Israeli soldiers along the Israel-Gaza border, claiming the attacks were “retaliations” for the Israeli Prison Service’s crackdown on contraband at Ofer prison. One IDF soldier was lightly injured in the sniper attacks. Israeli forces opened fire on the sniper, killing him. In response to the shootings, Israel halted the transfer of $15 million from the Gulf Arab state of Qatar to the Gaza Strip. In addition, the IDF struck a Hamas training camp in the coastal enclave. Since then, however, Israel has approved the transfer of the Qatari funds to Gaza in a bid to de-escalate the conflict with Hamas, which has been unable to cover payments to tens of thousands of employees in the Gaza Strip after the Palestinian Authority cut funding to the coastal enclave. On Thursday, it was reported that Hamas had refused to accept the new payment from Qatar, despite approval from Israel. Given Hamas’ refusal to accept the Qatari money transfer, the IDF estimates that this Friday’s riots on the Israel-Gaza border will be larger and more intense. With Hamas signaling its willingness to further escalate tensions with Israel, the Israeli security establishment has also beefed up anti-missile defenses, including the deployment of an Iron Dome anti-missile system in Gush Dan in central Israel.